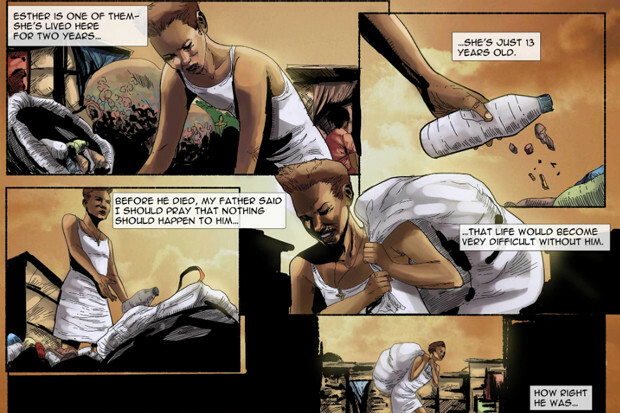 The story of Nigerian children facing a witch-hunt has been commended for being told using a graphic novel-style format. ‘Lost Childhoods: Nigeria’s fear of ‘witchcraft' ruins young lives' was published in November 2018 on Al Jazeera, but last week (3 April) received an Amnesty UK award in innovation. Photographer and videographer Marc Ellison underlined the importance of working with local artists who are more attuned to social and cultural cues, following similar successful stories. He collaborated with Nigerian artist Samuel Iwunze who produced the sketches both from Ellison’s photographs and reconstructions of scenes from interviews with characters in the story. "I gave him free rein to interpret the script, just the way he brought the story to life in the opening few pages where you see the children being chased," explained Ellison. "One of my favourite panels was the story of a young girl who now lives on the streets, and how her father and step-mother were threatening to drown her for accusations of witchcraft. The way he interpreted that was this very beautiful illustration of her underwater, struggling to come up for air and screaming 'no' as she’s underwater. The sense of asphyxiation is powerfully done. "It’s one thing for me to write what I think is a good script but it's another to bring it to life and engage the reader." The story itself is a mixture of graphic novel-style sketches, real-life photographs and video. Ellison said this was used to grant anonymity to young and vulnerable interviewees. After jetting out to Nigeria to shoot the surrounding areas and scenes for the story, he worked with Iwunze remotely from the UK. They used a Google spreadsheet to write the script, breaking down approximate illustrations per page, and adding notes for rough ideas on how scenes could work, acting as guideposts. "It's amazing that you can still produce something as in-depth and involved like this when you are thousands of miles apart. "One criticism the non-fiction graphic novel format gets is that people will say it's open to abuse and exaggerating or sensationalising a scene. "To combat that, I tried to make the drawings as real as possible. I made sure to take lots of photos of the dwellings, the forest, and the locale. Sharing those with the artists so they can ground their illustrations in reality was important." Detail, he said, is crucial because the format is open to liberties being taken, but detail came at a price of interviewing traumatised children. This consideration was always at the forefront of his mind. It necessitated splitting up interviews over multiple sessions to avoid asking too many sensitive questions and asking children to recall a difficult sequence of events or small details. For this reason, the story is also divided into chapters as a way of breaking up this heavy content and the multiple narratives within. "Some chapters do have a common thread so perhaps one character may pop up in a few chapters but it’s a nice way to delineate their stories. Also the content can be quite depressing for want of a better word, so having these bitesize portions maybe lessens the impact on the reader," he explained. Upon reflecting on the award, Ellison spoke of his honour to be recognised by Amnesty, an organisation known across the world for their human rights work, as well as praising local NGO’s Way to the Nations and BRCI for facilitating the interviews, and the Pulitzer for financially backing the project. "I’d like to emphasise the fact that this isn’t me being modest, this wouldn’t have happened without the bravery of the kids who were willing to talk about what happened to them," he said. "Also, not many media outlets experiment with this format because it's quite different and CMS systems can’t always handle this content. It’s great that Al Jazeera takes a risk with this illustrative format."